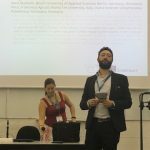 by the European Distance and E-Learning Network took place in Genua, Italy 17-20 June 2018 and was dedicated to the exploration of the micro, meso and macro dimensions of the digital learning landscape. 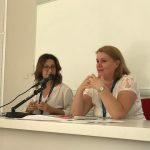 Synergy session: OpenVM: Opening Education for Developing, Assessing and Recognising Virtual Mobility Skills in Higher Education, Francesco Agrusti, Antonella Poce, Maria Rosaria Re, Roma Tre University, Italy, Ilona Buchem, Beuth University of Applied Sciences, Germany. The Synergy session facilitated the sharing of project outputs and research findings, offering the participants a platform to develop new ideas and plans, to create new partnerships by engaging the conference audience in highly interactive working group activities during parallel sessions. Workshop: Open Virtual Mobility – Designing the Virtual Mobility Learning Hub for Higher Education in Europe (link to slides), Ilona Buchem, Beuth University of Applied Sciences Berlin, Germany, Antonella Poce, Francesco Agrusti, Roma Tre University, Italy, Diana Andone, Universitatea Politehnica Timisoara, Romania. 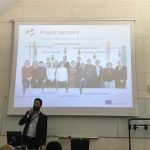 Our workshop was dedicated to a co-design of the Virtual Mobility Learning Hub for Higher Education in Europe and is part of the Open Virtual Mobility Erasmus+ project (openVM), which applies the principles of Open Education (OE) to promote achievement, assessment and recognition of VM skills. 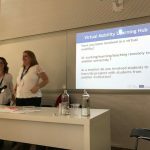 The aim of this session is to investigate how open credentials can be used in virtual mobilities in higher education context engaging participants in the co-design of the Virtual Mobility Learning Hub and its components including OER, MOOC, Assessment and Open Badges. 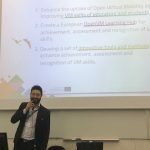 The user-centric design is following the principles of OE as laid out in the OpenEdu Framework by the Joint Research Centre of the European Commission. We thank all the participants in the synergy session and workshop for a very productive and helpful exchange of ideas for the OpenVM project including future cooperations and collection of good practice examples on different forms of virtual mobility. 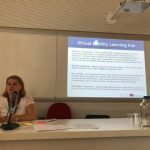 OpenVitualMobility project addresses the need of creating accessible opportunities for achievement of Virtual Mobility Skills in Higher Education. 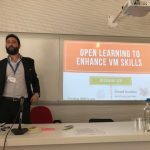 OpenVM aims at promoting and scaling-up Virtual Mobilities, as students and teachers in higher education using another institution outside their own country to study, teach or research for a limited time, without physically leaving their home.